This sculpture feels familiar, although it’s our first encounter. One-inch cubes of concrete zig-zag chaotically, at times bunching densely, at times breaking free, darting into open space. It resembles an unbounded, three-dimensional game of Tetris, though this doesn’t account for its uncanniness. While I’ve not seen this exact shape before, I know its pattern: this seemingly random sequence of cubes was determined by the rules of a random walk algorithm. 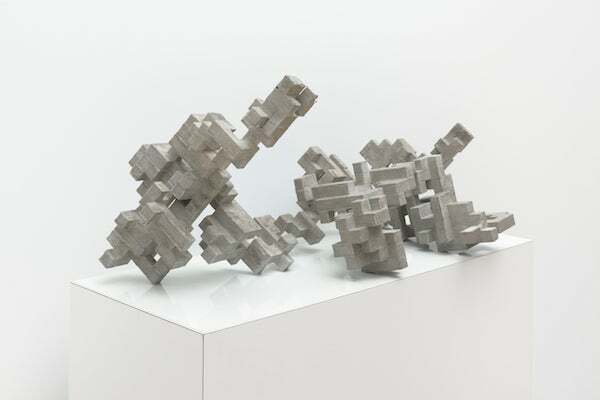 In Broken Volume (10L), 10 liters of concrete were formed into 610 cubes (presuming that no concrete was spilt in the making of this piece), where each cube was positioned at random relative to the previous cube. Random walk variations are exceedingly common in explanations of natural phenomena, describing everything from particles ricocheting and polymers tangling to drunken sailors stumbling from lampposts. Each walk is distinct yet recognizable because of the shared rules governing its formation. In a fascinating twist, Broken Volume’s rules are also its undoing. With no constraints related to structural soundness, the unwieldy piece snapped in two at a narrow point during installation. The rough fracture is visible among the otherwise smooth faces and right angles. Sets of rules, like those governing—and breaking—Broken Volume, are at play throughout a new exhibition at the Whitney Museum of American Art in New York City. Divided into two sections, the exhibition first takes on rule-based conceptual art, then focuses on programming in television and other screen-based works. Pieces from different decades interleave to capture not only themes but a sense of call and response. Sol LeWitt has a strong presence in the first section with a grand rendition of the fourth wall from Wall Drawing #289. Its name—4th wall: 24 lines from the center, 12 lines from the midpoint of each of the sides, 12 lines from each corner—is title, instruction and work of art. To exhibit a wall drawing installers must follow, and interpret, the instructions. Thus, each installation of a LeWitt wall drawing is unique: determined by the size and proportions of the wall and choices, in this case as to angles and line lengths. On the adjoining wall, nearly matching the floor-to-ceiling scale of 4th wall, are two mesmerizing software-generated video projections, slowly evolving based on a set of programmed, LeWitt-like rules. The diva of the exhibition is Nam June Paik’s monumental video installation. At 14 feet tall and 40 feet long, Fin de Siècle II dominates the space, reaching to the ceiling and dividing the hall on a strong diagonal. First created for a Whitney exhibition in 1989, Fin de Siècle II is here exhibited at full scale for the first time since then. Occupying center stage, it is the first thing one sees upon entering, and its flashing glow and booming audio permeate the gallery. 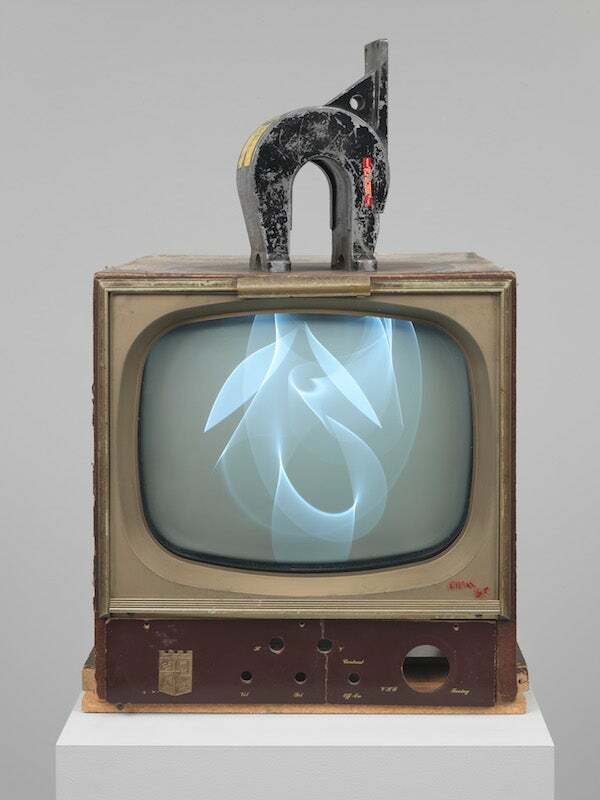 Clips of recorded television programs, including dancers and David Bowie, were spliced with art videos and are displayed on 207 televisions of four different sizes. The televisions are arranged in blocks that play independent video channels. Adding to the complexity of the visual frenzy, each television in a block can repeat the same image, or a block can flash up a single large image—sometimes upside down or sideways—with individual televisions functioning like pixels. The effect is incredible and inescapable, immersive and near–sensory overload. When passing underneath, one can note the scaffolding and the numerous circulating fans required to support and cool a wall of continuously running cathode-ray tubes. Nearby, another modified television, this one slightly larger and sporting long rabbit-ear antennae, literally exposes its inner workings. For Thrust, Earl Reiback dismantled a television—“detached and emptied the cathode-ray tube” and “scraped” the phosphor layer from the screen—and reassembled it. The final effect is mesmerizing, drawing the viewer’s attention back into the depth of space behind the screen, the plane where attention typically is focused. Reiback left a frame of the original phosphor layer on the screen so that a viewer simultaneously sees a screen image of shimmering blues and the beating depth of the ray tube with its added paint lines. It is a transfixing cutaway diagram and an eerie art object, exuding near-ultraviolet–purple light. Rules offer structure and limitation. Rules are familiar to scientists, as the ways we structure knowledge and control for variables, for instance. But they are an open-source method available across disciplines. In “Programmed,” artists play and experiment with algorithms and technology, working within limits but achieving effects greater than the sum of their codes or instructions. The duality at play in this exhibition is as separable as the wave and particle natures of light. To recognize only one explanation would be reductive; to see both is beautiful. “Programmed” is on view at the Whitney through April 14, 2019. Elizabeth Bailey is a trained artist and a chemistry PhD candidate at Columbia University.